When you become a Gold member by making your one-off payment of $ you get LIFETIME member rates on all PitchVision Academy online courses. That means you make at least a 30% saving every time you buy a PitchVision Academy course. Click here to buy your Gold membership and start making a saving today. Getting roped in to umpire is a tough job. Make the wrong mistake in giving the captain out LBW and you could end up paying for the rest of the season! That's before you have to worry about the more difficult Laws, or dissent from the fielders. All you want to do is a reasonable job when roped in. That's exactly what this online course has been designed to do: A a way to quickly learn the basics of umpiring without the hassle. Perfect for players, coaches and spectators who are passing a park match and find themselves doing a few overs. Gain the advantage. Learn from the experience of 20 years as a player and coach to improve your club's start to the season, mental strength and umpiring. Now with a discount meaning that if you buy 2 courses, you get the last one free! Are you providing the best possible coaching for your players based on the latest research into cricket coaching? Are you making the best use of technology in your coaching? Book PitchVision Academy to show you how to become a club who can produce a conveyor belt of cricketers to take wickets and score runs. At the heart of the The Cricket Asylum’s Player Pathway in Sowerby Bridge, West Yorkshire is the 1-2-1 coaching, this is the fastest way to improve your game… and we’ve just made it faster! From the dead of winter to the excitment of spring, this eBook covers every aspect of cricket preseason training. Stop getting frustrated by preseason training and start using this most important part of the year to make your summer go with a bang. In this eBook you will learn, step-by-step, the proven secrets of making the most of club preseason nets and training. Stop wondering "what could have been" and start to succeed like you never thought possible. With the right tactics, planning and preparation any side from the club 5th XI up can excel at their level. I've played in and captained non-professional teams and I know outside of the pro game you have to pick our battles and do the things that give us the biggest return in the smallest time. That's why in this course I'll show you the secrets and tactics I have learned through over 20 years of playing. Do you want one chance to become a cricketer? Monty Desai works every day to develop players who are ready for the IPL and ready for India. With these videos and a complete eBook, you can start your journey to become a cricketer too. Click the title for details. This special course is a collection of all Monty Desai's videos, advice and drills in one place. When you purchase this course you get unlimited access to all Monty Desai's guides to becoming a cricketer. During the 2003 World Cup the Indian side got within touching distance of winning the highest prize in one day cricket. This 30 page eBook reveals exactly how the team prepared, strategised, developed game plans and analysed every single cricketer who participated. You will read stories from the changing room, conversations with the stars and how it all came together. The Complete Cricket Youth Development Program pushes the boundaries of the traditional approach to youth cricketers development and coaching. This is the first course in a series designed for parents, teaches or coaches of young people. In this Cricket Discovery course we cover the approach for children aged 6-9 years old. The program covers the critical coordination window of opportunity that closes on all kids as they get older. Miss this window and you can't catch up again. We tear up the rule book and lay down some new principles. With these methods at your fingertips you will be able to develop fast, athletic, coordinated, skilful cricketers who both enjoy the game and are streets ahead of their peers. Are you one of the coaches who’s not able to make the most of the young players in your setup through no fault of your own? When you buy the Darren Talbot Coaching Plans you get exactly what you need to solve your coaching problems. This U8-U9 edition of the Darren Talbot Club Cricket Programme provides all the planning resources you need to develop children in the under 8 and under 9 age groups. It’s designed to take the pain out of planning for 7-9 year olds so you can get back to the coaching and helping your players win more matches. This U9-U10 edition of the Darren Talbot Club Cricket Programme provides all the planning resources you need to develop children in the under 9 and under 10 age groups. It’s designed to take the pain out of planning for 8-10 year olds so you can get back to the coaching and helping your players win more matches. This U10-U11 edition of the Darren Talbot Club Cricket Programme provides all the planning resources you need to develop children in the under 9 and under 10 age groups. It’s designed to take the pain out of planning for 9-11 year olds so you can get back to the coaching and helping your players win more matches. This U11-U12 edition of the Darren Talbot Club Cricket Programme provides all the planning resources you need to develop children in the under 11 and under 12 age groups. It’s designed to take the pain out of planning for 10-12 year olds so you can get back to the coaching and helping your players win more matches. This U12-U13 edition of the Darren Talbot Club Cricket Programme provides all the planning resources you need to develop children in the under 12 and under 13 age groups. It’s designed to take the pain out of planning for 11-13 year olds so you can get back to the coaching and helping your players win more matches. This guide makes it easy to learn the basics of cricket for kids aged 7-12. Instead of wondering what is going on you will know what to do and how to practice. You will soon be having great fun scoring runs and taking wickets! The games and quizzes teach you everything you need to know to get a head-start. This eManual contains 22 coaching games that you can use to develop skills in young cricketers aged 6-13. Win More Colts Matches, and prepare better too is an eBook that shows you how to acheive greater on-field success for junior cricket teams; in the short and longer term. Click the title to find out more. The aim of the the Inspired Cricket Manual is to act as a resource for coaches and players, so that you can get the most benefit out of every single practice session, and be inspired to make sure that everyone involved enjoys themselves. If set-up and run in the right way, the same drills, games and challenges in the Manual can be used to work with U9’s who have never played before, all the way through to full-time professional cricketers. This series of video-based drills is the first of 6 weeks of training plans that you can use directly "out of the box" when you need fun and effective drills for training sessions. The drills are adaptable to any age or skill level. This series of video-based drills is the 2nd of 6 weeks of training plans that you can use directly "out of the box" when you need fun and effective drills for training sessions. The drills are adaptable to any age or skill level. The acclaimed follow up manual for coaches and parents to deliver "EPIC" training sessions and more wins on the pitch! This series of video-based drills is the 3rd of 6 weeks of training plans that you can use directly "out of the box" when you need fun and effective drills for training sessions. The drills are adaptable to any age or skill level. This series of video-based drills is the 4th of 6 weeks of training plans that you can use directly "out of the box" when you need fun and effective drills for training sessions. The drills are adaptable to any age or skill level. This series of video-based drills is the last of 6 weeks of training plans that you can use directly "out of the box" when you need fun and effective drills for training sessions. The drills are adaptable to any age or skill level. This series of video-based drills is all 6 weeks of training plans that you can use directly "out of the box" when you need fun and effective drills for training sessions. The drills are adaptable to any age or skill level. Video analysis gives you access to high quality specialist coaches with the insight you need about your technique. You upload your video to the site and a high quality coach looks over your technique. PitchVision Academy provides the best technical analysis and gives you the personalised drills and advice you need to succeed. Most players start with Twenty20 cricket as a youngster, but how many master the techniques and tactics of playing the shortest format? This bundle of online coaching courses from Gary Palmer and Ian Pont will help you play or coach Twenty20 as a unique format. PitchVision Academy Online Coaching Gift Vouchers are now available: The perfect present for the cricket-mad player, the vouchers allow anyone to buy online coaching courses, or book a coaching session with a local coach, from PitchVision Academy. The Better Senior Training Sessions eBook looks at how to restructure these senior training sessions within the limitations of your club to make them useful. Have you ever wondered what the heck cricket is all about? Point to Fine Leg s the perfect eBook for all the women around the world who want to give cricket a chance but have no idea where to start. Written in an accessible, fun style from the perspective of women you will learn all the important stuff about the game; like how to know what’s going on and what to wear to the match! One of the lasting images of captaincy was seen during the Headingly Ashes Test in 1981. Despite the chaos surrounding him, England captain Mike Brearley calmly adjusted the field with one hand. The other remained in his pocket. He had the assurance of a man confident in his ability to maintain control under even the most difficult of cricketing circumstances. Good Captaincy is a difficult thing to define, and even harder to execute. Practical decisions and and inspirational judgement go hand in hand. Now ,arguably the greatest Captain in cricket history has developed his own groundbreaking online, interactive Captaincy course. This is Brearley's first major work since 'The Art of Captaincy' was published to critical acclaim. His ideas and methods have never been so alive and accessible to all captains through interactive words, sounds, interviews and pictures. Whether you are an experienced captain or have been elected to lead the school team for the first time, this course will guide you through the pitfalls and show you how to follow one of the great cricketing minds to captaincy success. Through this course you can learn the secrets that helped Alvin Kallicharran become a regular in the best Test team of its time: The West Indies. Follow my advice and you can make the most of your talent, moving up standards. As a batsman, like Kalli, you will be able to play the best fast bowlers, dominate spinners and build large innings with patience and confidence. When you buy this bundle you save 20% on 3 online coaching courses that focus on developing tactics, getting you to the next level. Spin bowling is a highly specialised skill and the most difficult ways to deliver the ball in consistently. It takes practice, but not just any practice. Truly successful spinners understand their game. That's why this course will teach you everything you need to understand your individual needs including; A complete step-by-step guide to getting a repeatable action that you will trust under pressure, Proven drills for improving your accuracy and turn that are guaranteed to get you more wickets and a better strike rate and how to use variations to outwit with batsman. Are you just starting out as a leg spinner? This course teaches you the basics of leg spin from the action through to your tactics and attitude. You have moved beyond the basics and have played a bit. You are no mug with the ball. Now you want to know the tricks, techniques and tactics that get you wickets regularly and turn you from an everyday spinner to someone who can change games or even change seasons. Have you ever wondered what it was like to be Shane Warne at his peak, or Abul Quadir? Have you thought how wonderful it would be to know how to bowl in ways that tie batsman in knots? Those great bowlers could do it because they understood the key to being a high class leg spinner. Spin bowling is a creative and a very difficult art to master.Spin Bowling Project shows you the tips and techniques used by the masters of spin bowling: Leg Spin, Off Spin, Googly, Flipper, Doosra, Slider, Top Spinner, Arm Ball, Faster Ball, Tactics, Tips, Drills and Field Placements - It's all here! Learn and apply these techniques and tips, supercharge your bowling and become a wicket taking machine! Plenty colour photographs and figures accompanies the clear explanations, making for very easy understanding and learning of the techniques involved. The essential online guide to leg spin, from one of the best leg spin coaches working today. Leg Spin bowling this course will give you the drills you need to get you started when you begin bowling leg spin, and that you can refer back to right through your career. Having a goal at your training sessions will help you to enjoy your training and get more out of it. As well as your bowling will improve a lot.This course has practice guidelines that you can refer to throughout you career. Leg Spin bowling is the most difficult skill to master in cricket. A lot of leg spinners have talent, but don’t have the coaching to help their talent. So what I have done for you is put courses together with the tips and tricks I used to have success and hopefully this course will improve your bowling. Try it! Are you not having enough success with your leg break? Do you need something more? Some variation? Is everyone else is bowling them but you’re not? Have you tried to bowl a flipper or a googly, but you have not had the success you want? This eBook will help you improve. Switch hits, reverse sweeps, big hits, smaller boundaries… this is T20 batting, and it’s ruining real spin bowling. his course will discuss how to bowl in T20 cricket. In this course I discuss how to analyse the batter's technique. We look into the common techniques of batters. I’ve broken batters techniques down into a few simple categories to make easy to learn and analyse. Spin Bowling Master Class is an online video with 22 spin bowling tips. Learn how to overcome both issues with Andy Caddick's tips, drills and techniques. Whether you are a coach or player, this course is filled with advice from someone who has seen fast bowling success at the highest level. The truth about swing bowling is not magic, but when it is done right it makes you look every bit the sorcerer: the reliable guy your captain can throw the ball to, safe in the knowledge you will give him 4, 10 or more stellar overs that challenge batsmen in all situations. You already know that good swing bowlers are about more that running in, trying to hit a length and hoping it swings. You know that you need to be quick thinking, bold, confident and aware of your own game. With some simple adjustments you can easily be the self-assured tactically aware bowler you have always wanted to become. Get your hands on all Nathan Bracken's swing bowling masterclass tips in this value bundle of courses! Fast bowlers are made and not born. This course shows you what most bowlers do wrong in their action and how you can avoid making the same mistakes. The exclusive drills will show you how to line your body up and get your action into the perfect position for generating maximum pace. Yet you don't have to sacrifice accuracy. Unlike most coaching methods, this course teaches you to be accurate and as fast as you can be at the same time. Use this course to help you start to scare batsman out. In twenty20 cricket the odds are stacked in the favour of the batsmen. Every swing is not just a clobbering of the ball, but also to your ego. Yet traditional coaching has always focused on preparing players for longer games. Twenty20 has overtaken things but the coaching stays infuriatingly stuck in the old days. With the right tactics and mindset, things change dramatically. Imagine how it would feel if you could bowl successfully in the short game. Click the title to read more about what to do next to become a better Twenty20 bowler. All of Ian Pont's world-class batting and bowling coaching in one bundle to save over 30% on batting and fast bowling advice from an International coach and published author. Ultimate Pace Secrets completely blows the lid off speed coaching once and for all. Fast bowlling masterclass from England's all-time greatest wicket taker. Click the title for more information. To enhance your game, access our unique and extensive library of coaching tips, drills and skills. Gain an insight in to how First Class cricketers practice, and with this knowledge give yourself the best chance to follow in their footsteps. Fast bowling puts huge demands on your body. You risk a premature end to your bowling career through huge impact and twisting forces every time you bowl. And that programme is available for you to get instant acess right here, right now. If you are an experienced fast bowler who wants to take strength and conditioning to the next level, then this is training plan for you. The goal of the training program is to transform you into an Athletic Speed Demon. Respected coach Dr Ganesh Dutt Chugh brings you a complete guide to the fundamentals of fast bowling. Armed with this information you will be able to be a better bowler and help others become better bowlers too. If you want to enjoy fielding and excel at it, there is no one in the history of the game better to learn from than England cricketer Derek Randall. This course covers the essential drills for improving your skills. It also gives you an insight into the secret of how you can become more alert and have incredible anticipation, just like Derek patrolling the covers for England and Nottinghamshire. Great fielding raises the game. A stunning catch or run out can turn a match. Solid run-saving makes the difference between a win and a loss. That's why Mark Garaway has chosen to focus on the latest research into fielding, and how he has successfully applied new throwing and catching methods to players from international to school levels. Now you can learn these secrets too. To be the best you can no longer get away with average fitness levels or fielding ability. Players who are not physically prepared will miss out on the chance to do something great. The fastest way to improve your player's fitness levels and fielding skills is through a series of well-planned drills. This 158 page eBook contains those practices. The Handbook of Cricket Drills has 47 drills that have been used at the highest level by me, Shayamal Vallabhjee, to develop players in the Indian and South African national sides as well as Nashua Dolphins cricket team. Wicketkeeping hurts. I’ve been through the worst as a keeper with over 20 years experience at first-class and club level. I learned what works to reduce the pain. It took a long time and a lot of trial and error. Learn all the tips and techniques required to become a top-class wicket-keeper. As a wicket-keeper and coach, it struck me how little good wicket-keeping coaching material is available. I therefore decided to develop this book. It is the only specialist wicket-keeping book on the market and is a single, comprehensive reference for all coaches and aspiring wicket-keeping geniuses! As all professional cricketers know, you need to be fitter than ever if you want the edge on the field. However there are many myths and mistakes. This professionally designed course guides you through the elements you need to know about fitness that will improve your cricket. You will learn why it's important to train, what the best methods are in detail and how to design a plan for your individual needs. You can use the methods in this course to improve your game however fit or talented you are now. How many times have you seen a pretty 20 or 30 get wasted and a big hundred thrown away? BATEX solves that problem by using simple audio cues to make nets more realistic and let the runs flow. Intuitively, we all know that balance is important in cricket; batting, bowling and fielding. We can learn a lot from the martial art disciplines where control of body weight is more important than pure power and strength. But what if you don’t have the time to become a black belt? Click the title to find out how to improve your balance. A coach can tell a lot about a cricketer by observing the attitude a player takes towards stretching. Often players will demonstrate their focus by preparing diligently in the basic components of training such as stretching. This course takes you through essential injury prevention exercises for cricket. All exercises have been used by Dr. Houghton at ACE Cricket Academy (Western Australia). The quicker you are able to judge the ball, the more time you have play the right shot or pull off that brilliant catch. When you purchase "Sports vision training for cricket" you can work on the critical yet often overlooked area of hand-eye coordination. The tools in this ebook allow you to improve your vision and processing skills in highly cricket-specific ways. This is the first time this new and highly innovative approach has been revealed outside the professional game. An approach that has delivered remarkable results for the elite players Shayamal has coached including: The Indian and South African national teams, players on the ATP World Tennis tour, the Indian Davis Cup team and Nashua Dolphins cricket team. This presentation is a complete cricket academy camp plan with a 2 week in-season physiology guide plan for fast bowler conditioning and recovery. If 80% of cricket is mental why do we devote so little time to improving those skills? This course solves that problem for you. We reveal the secrets of how first class players get the mental edge. Instantly usable and proven techniques include: The myths of mental training, how to start using professional techniques today, ways to increase confidence, concentration and why 'the zone' is something any player can experience. Imagine how much better a player you would be if you could resolve 90% of your technical errors. Your setup is the biggest single cause of a lack of form and you may not even realise it. This course shows you how to correct the inevitable bad habits, choose your perfect grip, stance and backlift for your game and improve your run scoring. Being able to drive well is guaranteed to get you a huge number of safe runs against all types of bowling. Also, understanding the feel of driving correctly allows you to build other shots easily. This course shows you the secret drills and progressions used by International players, starting with nothing more than a tennis ball. Use them and become be the envy of your teammates with your effective front foot shots. Download the innovative eBook that teaches you how to bat with the techniques and tactics of world class players. This eBook will show you how to become the complete batsman and batting coach. Have you ever wanted to learn or coach destructive back foot drives? Using these proven methods you can develop shots through the classic V then learn to play through a wider arc on the off and leg side. Learn the drills that can improve your back foot 'hitting zone' which in turn will give you the power and timing you need to be successful. Could you do with improved confidence against good bowling? A strong defensive technique allows you (or those you coach) to build an effective innings, survive spells of hostile bowling and rotate the strike in limited over games. This course shows you the techniques, tactics and drills that all good batsmen need to succeed. Twenty20 requires you to score more runs off more deliveries than any other main form of the game. This course shows you how to effectively bat in Twenty20 to maximise scoring while keeping risk down. If you want to learn how to hit length balls for six, work good deliveries into gaps in the field and keep yorkers out this is the course for you. How much easier would batting become if you could play spin bowling with confidence? Good spinners are great readers of batsman and can quickly work out your technical flaws; exploiting them and sending you back to the pavilion wondering what went wrong. What if you knew what to do in any situation to defeat that wily spin bowler? This course gives you the tools and drills to learn how to play spin with the highest chance of success. We discuss the tactics of driving and sweeping, show you the key coaching points you need to adapt to spin and demonstrate the drills you can take to the nets to practice. If you want the complete guide to batting, this special course is a collection of Gary Palmer's videos, advice and drills in one place. When you purchase this course you get unlimited access to Gary's batting courses. It's crazy, but there are no coaching manuals on the most important aspect of batting anymore. It's like technique has gone out of fashion. Coaching without technical knowledge is like writing a novel with no understanding of spelling and grammar: Impossible. This course proudly wears its technical knowledge on its sleeve because, like you, we know technique builds confidence more quickly than anything else. That's why it contains a 92 page book, 182 videos and Quintic Cricket video analysis software all in one place. After years of experimenting and developing Gary Palmer has come up with the ultimate batting session; it teaches you to bat in a way that has never been taught before. Trigger moves are all the rage. But they are also one of the first things to go wrong with batsmen. I see it every day with the players I coach and it costs them runs until we correct it. This course gives you a proven, effective method instead. We have all been tied down by accurate bowling: every ball on a line and length and you just can’t get it away. In your efforts to get away you end up playing a bad shot, get out and fume as others do the job that you failed to complete. Attacking Batting is a step-by-step guide to learning creative shots that help you score quickly instead. 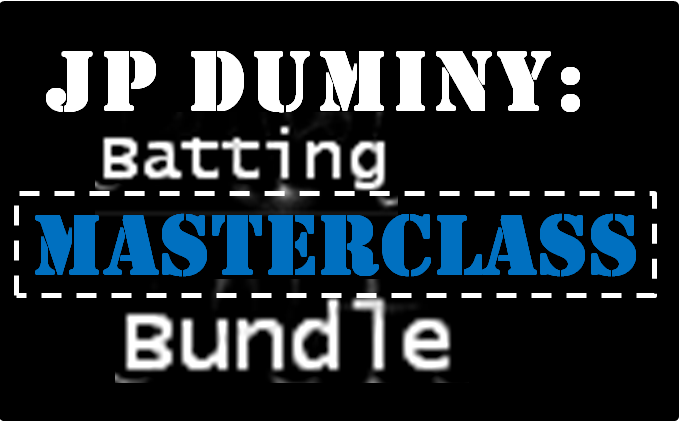 This is Hit the Ground Running: 2 online coaching courses that combine to make a complete batting masterclass bundle from JP Duminy. When you buy this course you'll get full, unlimited access to all JP Duminy online courses (listed below). Finally with one payment you will be able to access all the flair and classical shots used by JP Duminy, preparation methods, tactics and mental tips. this is the classic techniques and tactics of my 2-course series on batting: Hit the Ground Running. In this exclusive course I show you not just my basics to classic technique, but also the tactics I use to be a successful batter. It's a perfect base to play all forms of the game. Cricket is played mostly in the mind: the mentally strong are the ones who make it to the top. You can learn these mental skills just as you can learn to hook, pull cut and drive.